I have talked about many of my travels in the pages of this website. Each time I have an opportunity to play chess with wonderful people I marvel at the enjoyment that they get from moving the pieces. 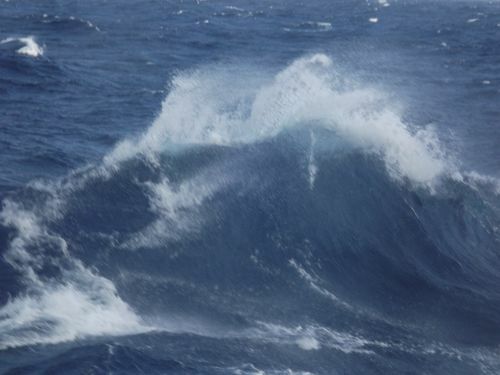 This experience was no different from many others except that the Ocean Princess, a cruise ship which was traversing the Atlantic Ocean was facing off against two large storms and moving through 20 foot waves. We were expecting to board the ship in Rome, but our connecting flight was late and so we started in Genoa, Italy. Once aboard we got settled in and I approached the Cruise Director, Adam Love. That really was his name. 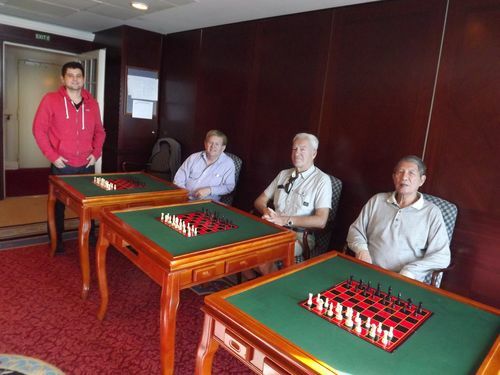 I asked, “Can you place in your daily announcements that chess players can meet in the Card Room for casual play?” He agreed so I proceeded to the Card Room at the appointed hour on days when we were at sea to meet fellow chess enthusiasts. I found some of the traditional red and black plastic sets, but I set up mine as well. The first person to arrive was a fellow from Sweden. Jockum, age 69 was from Stockholm. 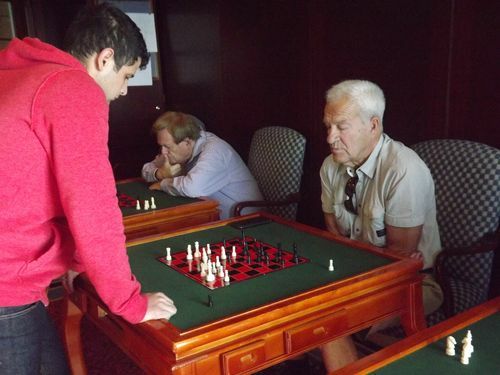 I learned very quickly that this cruise was going to be a chess challenge. Jockum was one of those players who came up with unusual openings and interesting ideas. We went back and forth; winning and then losing to each other followed by a draw and then back to winning and losing. Leo Wang, originally from Taiwan was another participant in our circle of chess. Leo was just as challenging as Jockum. I found Leo to be a strong opponent with the black pieces and he never failed to show up for our chess sessions. 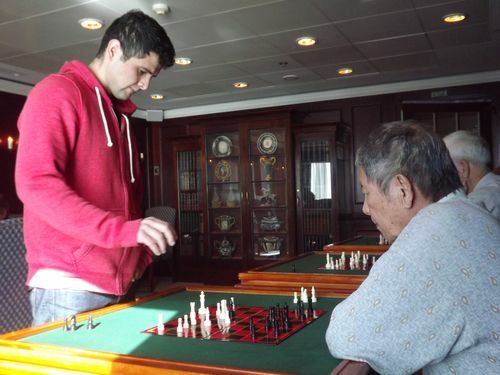 Most of the cruises I take involve senior citizens and retired persons. It is not often I meet someone who is in their 20’s. The young person in question was Jesus Rodriguez originally from Tampico, Mexico, but he now lives in Texas. He was the final member of our group of four. I asked Jesus if he had taken several cruises before. He replied, “No, this is my first time.” I was quite surprised because of the length and location of this trip. I would have thought he might have chosen something shorter and closer to his home. That aside, he was skillful and his game continued to get better. After we had played several days during the cruise, I suggested that we have a real challenge. I felt that Jesus was strong enough to play a simultaneous against Jockum, Leo and myself. Since this was his virgin voyage and he was the youngest member of our group, it would be a great challenge for him. The day of the simul it was very stormy and windy. The waves were around 15 feet high so we were rocking and rolling. The photo below shows just how bad it was, but we played on. The results of the simul were two wins for Jesus and one loss, but the story does not end there. We had another guest come to sign-in and he looked at the wallchart I had prepared for our casual play: Player 1-Jesus, Player 2-Jockum, Player 3-Dewain and Player 4-Leo. His comment was certainly classic, “You mean I have to play Jesus Christ? That is not fair.” He chose not to play chess with us. The chess adventures continue.